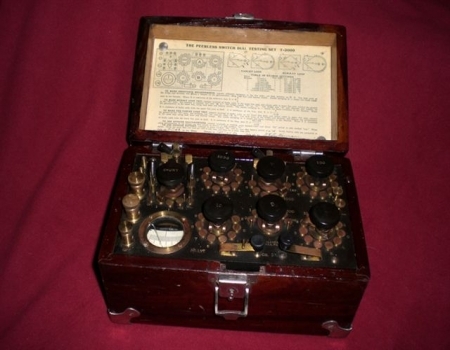 A Wheatstone bridge is an instrument that was invented by Samuel Hunter Christie back in 1833. 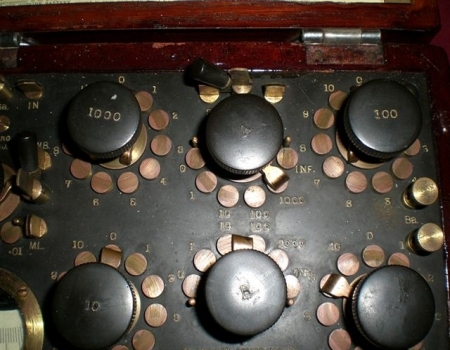 Then in 1843 it was improved and popularized by Sir Charles Wheatstone. This instrument is used to measure an unknown electrical resistance by balancing two legs of a bridge circuit, one leg of which includes the unknown component. Its operation is similar to that of the original potentiometer except that in potentiometer circuits the meter used is a sensitive galvanometer. 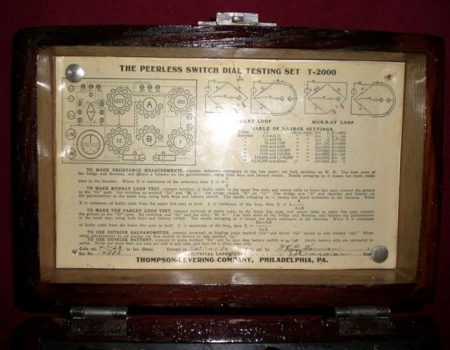 The example on this page is named "The Peerless switch dial testing set model T-2000" and was made by the Thompson-Levering company in Philadelphia, PA. The instructions which are tacked to the inside of the top cover show that the coils were adjusted on April 7th 1923. The Wheatstone bridge illustrates the concept of a difference measurement, which can be extremely accurate. Variations on the Wheatstone bridge can be used to measure capacitance, inductance, impedance and other quantities, such as the amount of combustible gases in a sample, with an explosimeter. The Kelvin double bridge was specially adapted from the Wheatstone bridge for measuring very low resistances. A "Kelvin one-quarter bridge" has also been developed. It has been theorized that a "three-quarter bridge" could exist; however, such a bridge would function identically to the Kelvin double bridge. 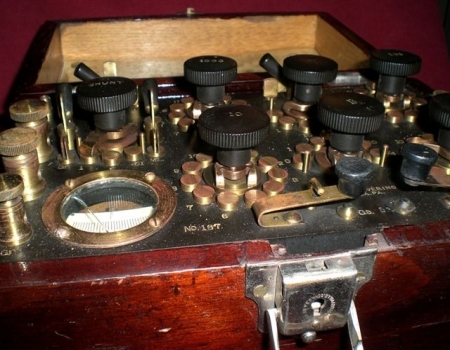 The concept was extended to alternating current measurements by James Clerk Maxwell in 1865 and further improved by Alan Blumlein in about 1926. 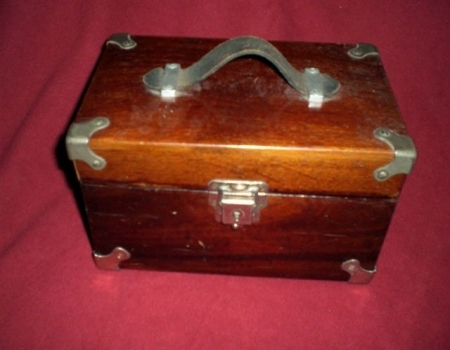 The photograph on the left shows this Wheatstone bridge in it's carrying case. The photograph on the right is a picture of the instructions, model number, manufacture and date of last calibration tacked onto the inside of the top cover. The instructions describe how to make resistance measurements, how to make a Murray loop test and how to make the Varley loop test. 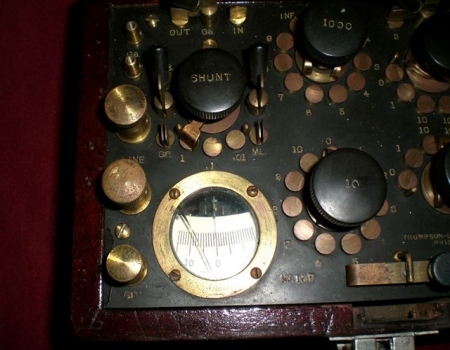 They go on to describe how one would use an outside Galvanometer and how to connect an outside battery. 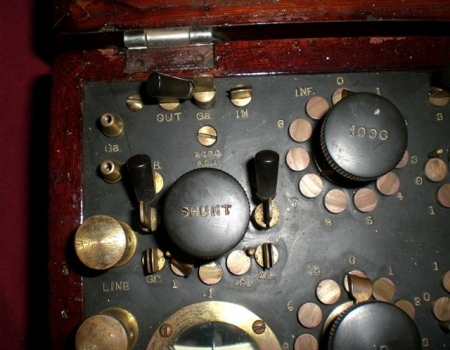 These next two photographs show the controls located along the top of this Wheatstone bridge. 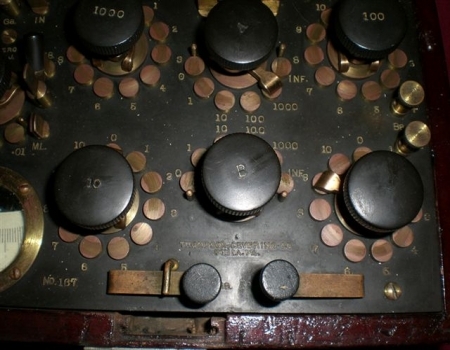 These next two photographs show the controls located along the bottom of this Wheatstone bridge.